Alex is a 6’6″ 171 lbs. 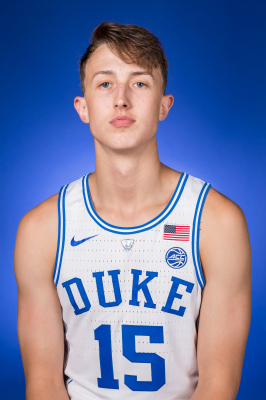 Guard, from Roswell, Georgia, who will wear #15 for Duke this season. He was ranked #55 overall by Rivals & #66 by Scout. He was ranked #85 overall & #20 among Shooting Guards in the 2017 class by ESPN. Alex comes to Duke with a multitude of accolades culminating in his being named Atlanta/North Fulton Player of the Year, as a Senior. Thus, he attracted offers from Louisville (before the scandal), Syracuse, Georgia Tech, and Georgia. Alex is athletic and can play at the #2 and #3 positions. He has a quick release and is a good 3-Point and Mid-Range shooter facing, or falling away from the basket. He can also play above the Rim. At 170 pounds he needs to add muscle and weight. In his own words “I need to improve my ability to play through contact.” Possessing a need to develop his body and a desire to continue his academic career, we should have a chance to be seen at Duke for the next 3 or 4 years. He was recruited by Coach Jon Scheyer. Alex is the son of David and Crystal O’Connell. He has 2 brothers, Shawn and Brady. Shawn plays Forward at Georgia Southern. His family’s athletic genes include his father, David, who played basketball for Duke from 1973 to 1976. His 2 uncles played at Notre Dame and Xavier. Just about every organization is evaluated for their 1st 100 Days, but we’re going switch things up a bit. 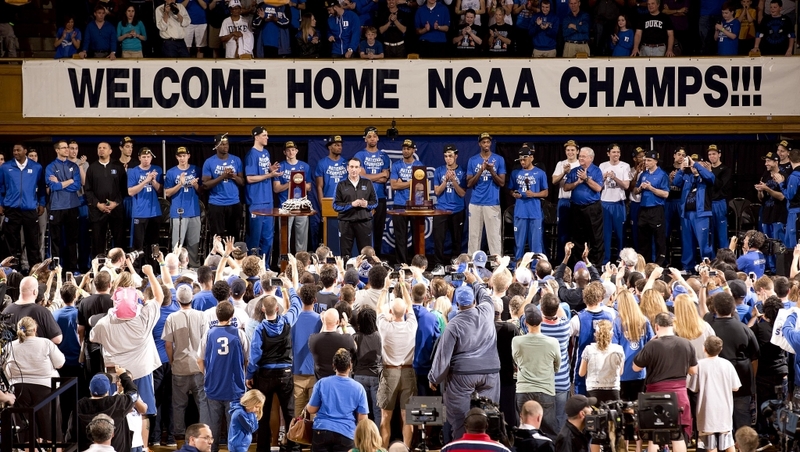 It has been 100 days since Duke won it’s 5th National Championship. Which championship run was more dominant, 2010 or 2015 ??? I think that they were very different teams. The 2010 team was dominated by Seniors, who were more seasoned, more versatile, and, I believe, played a tougher schedule to the Finals. They won the ACC, led in a bunch of stats, won the ACC Tournament, and then the Big Dance. This 2015 team had plenty of ups and downs, had far less seasoning, was not very versatile inasmuch as everyone had well defined positional responsibilities, and was not nearly as dominate in the ACC as the 2010 guys were. This 2015 team surprised a lot of experts. The 2010 team only found themselves after Brian Zoubek was inserted into the starting lineup in January. This team was beating everyone straight out of the gate. There were some similarities though. The 2010 team was dominated by upperclassmen while the 2015 team was carried by Freshmen, but both teams got better when there was a defection or two. Elliot Williams was meant to be a star at Duke. He transferred surprisingly, just before the start of the season, leaving many with an underwhelming feeling of the upcoming season. Williams was meant to be the starter at Point Guard (probably one reason he didn’t hesitate to stay as he preferred off-guard), and left only Nolan Smith and Jon Scheyer in the Backcourt. That prompted Andre Dawkins to leave high School early, however tragedy would befall the saviour-to-be when his mother was hurt and his sister killed in a car accident on their way to see Duke play. This forced Coach K to use a tight rotation which worked out brilliantly. The 2015 team dropped down to “eight” after a disgruntled Rasheed Sulaimon was expelled. Maybe there is a pattern here. Coach K wins with a tight rotation. This doesn’t bode well for the upcoming season though. What was your most memorable play from the Big Dance ??? I think that play in the Wisconsin game where Grayson got that loose ball and began to take over. Up to that point, I thought it was anyone’s game. Quinny & Matt we’re cold as ice, “Oaks” & Justise had 4 Fouls, and Grayson was so solid and inspiring that the tired Wisconsin guys were flummoxed. It was the reason why Duke had to create the “One Shining Moment Award” for Grayson at the Annual Awards Banquet. Most of the games in the tournament were over pretty early, except for the Final Four and Championship game (the Utah game was also close but Duke was in control). Duke’s play in the waning minutes was pretty inspiring. First Grayson Allen and Tyus Jones eroded a 9 point lead by the Badgers, that inspired Okafor, who reentered the game. Okafor picked up 4 Fouls and was relegated to the Bench early until just under 3 minutes left on the clock. Coach K took a chance and inserted the Center back into the game. There was a sequence when Okafor scored 4 Points on 2 offensive rebounds. On one occasion “Frank the Tank” held his shoulder’s down, but Jahlil executed a brilliant spin move in the paint for a “plus one,” though he would miss the free throw. On the other end he played Kaminski straight up one-and-one and blocked his shot cleanly. By the time that sequence was finished, Duke had retaken the lead, however the Badgers hadn’t gotten to the Final Four without a fight. They looked to storm back, but Tyus Jones was not going to be denied a championship, something he prophesied a year earlier. What was the most heartbreaking loss of the season ??? Things were off to a bad conference start with back-to-back losses at State, and then Miami at home in January. Then Coach K outsmarted Rick Pitino in their house and the ship seemed to be righted. Then came the Notre Dame game. It was a turning point for the team, they lost a hard fought game, and Rasheed was thrown off the team the next day. It is when the saying “8 is Enough” got a new meaning, inasmuch as Duke now only had 8 scholarship players on the roster. It was when those kids realized that if they wanted to fulfill their dream of a National Championship, they had to become men. Then the following game, Miami happened, and the wheels literally came off the cart. The defense that looked vulnerable against bottom feeder Wake Forest, was subsequently exposed by NC State. They got totally hammered by Miami at Cameron Indoor Stadium, snapping a 41 game home winning record. The Blue Devils immediately moved from a team with teething problems to a broken one. What was the most inspirational win from the past season ??? Easily, the Virginia game right after the Notre Dame game, then the trouncing of Notre Dame 8 days later at Cameron. It was beginning of Duke winning thru February and didn’t stop until they got caught napping against Notre Dame in the ACC Tournament. 12 games in total, then another 6 to win the National Championship. The game that showed that Duke was a national contender was the victory at Wisconsin in the ACC/Big Ten challenge. After that the sky was the limit, if a Freshman laden team can beat a previously Final Four team on their own home turf. The most inspiring game was not a victory but a loss to Notre Dame. After losing back-to-back games to NC State and Miami, Duke was in limbo. They rebounded to beat Louisville and St. John’s on the road, and PITT at home, but they didn’t have the same fire they previously had where they broke teams early and cruised to victory. Those 3 victories were the grind it out types. Then they went to Notre Dame, who were 8-1 in the ACC play at the time, while Duke stood at 4-2. This was a really big test and Duke pushing the Irish right down to the wire until Jerian Grant made a few clutch (lucky) plays. After that game the resounding feeling among the Duke squad was that they could have won. Then there was the unfortunate dismissal of Sulaimon. Next game was against undefeated Virginia, on their home turf. It was a tough victory, that game Duke got their “mojo” back, propelling them on a 12 game winning streak. All season we lamented Duke’s lack of perimeter defense and rim protection but in the tournament, they seemed to turn this around. Have you ever seen a bigger turn around ??? In modern Duke history, I’d have to say that the way the 2010-11 Team reformulated their chemistry after the injury to Kyrie Irving. They changed the way they played, won the ACC Tournament, and were awarded a #1 Seed, but were sent to the West Region. Unfortunately, their formidable efforts went down the drain when Irving suddenly proclaimed himself ready for play, upsetting that chemistry, leading to the slaughter by Arizona in the Sweet 16. As we now know, he got back on the floor by convincing Coach K he was staying for at least another year, but was really looking to be drafted #1. These Freshmen were clearly talented, and were a complete fit for each other. Everyone assumes that they just turned up, won, then headed to the NBA. That couldn’t be further from the truth. Coach K has really earned his respect with how he masterminded this 5th NCAA Championship. Throughout the tournament no Duke player was consistent offensively, but collectively their Defense prevailed every game. If anyone had suggested in early January, that Duke would win a championship based on their Defense, they would have instantly been medicated on the spot and taken away. 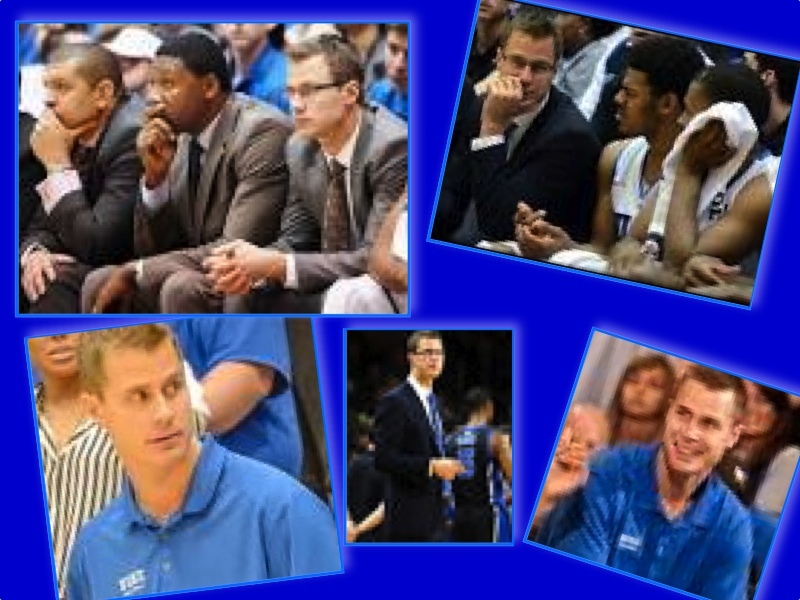 This was a remarkable turnaround and the Duke coaching staff has to be given credit for such a miraculous job. Justice Winslow was the chief operator on the Court, with Matt Jones, and especially in the Championship game, Amile Jefferson. Okafor maybe a terrible pick-and-roll defender but he can straight-up defend the Post. Quinn Cook and Tyus Jones realised that on their own. They may struggle to stay in front of their mark but together they were lethal. Throughout the season, who do you think was the most unappreciated player ??? No faire picking Grayson !!! I think it’s a tie between Amile and “Plums” … These guys are different inasmuch as Amile is more of the “strong, silent type” where “Plums” was high energy in his play and “pumping up” the team and the fans !!! Imagine someone who could pump up the Cameron Crazies more than they already are, but “Plums” did it !!! Amile was the benefactor of double teams on “Oaks” on the offensive side, but more often than not, he was deft on the defensive side. Later in the season, he was asked to play the Pivot at the Foul Line, and work the “pick-and-roll” or “dish-and-drive” ... something he had not done before. I never saw anything but positive captaincy from him, as he used that incredible wingspan to his advantage. His stats bespeak him as the solid, dependable presence that allowed the team to “click” !!! “Plums” had the more difficult task of spelling the guy who was in his presumed position way back when he accepted his Red Shirt. He did it with the class and verve of the gentleman he is !!! How often did we see him excel on both sides of the Court in 2-3 minutes, only to be set back down at the next TV Time Out ??? I never once saw anything but leadership and acceptance of his role, all while fist pumping and shouting encouragement to his teammates !!! I look forward to seeing more of his trademark thunderous dunks in his last season at Duke this year. We didn’t see Grayson Allen that much, so I agree that Amile Jefferson and Marshall Plumlee are worthy candidates here. I would also add Matt Jones to that equation, however they will all come up short next to Quinn Cook. For 4 years we have all lamented the faults of the Senior Captain. At one point there were grumblings that he should transfer, but Cook withstood the criticism. He was even upstaged multiple times by Freshmen, but Cook kept coming … kept plugging away. He suffered some embarrassing defeats in the NCAA tournament. Twice, he was a part of teams that lost in the 1st round (actually 2nd round but first game in the tournament), which is very un-Duke-like. Can you imagine the nightmares he must have had before the tournament started ??? 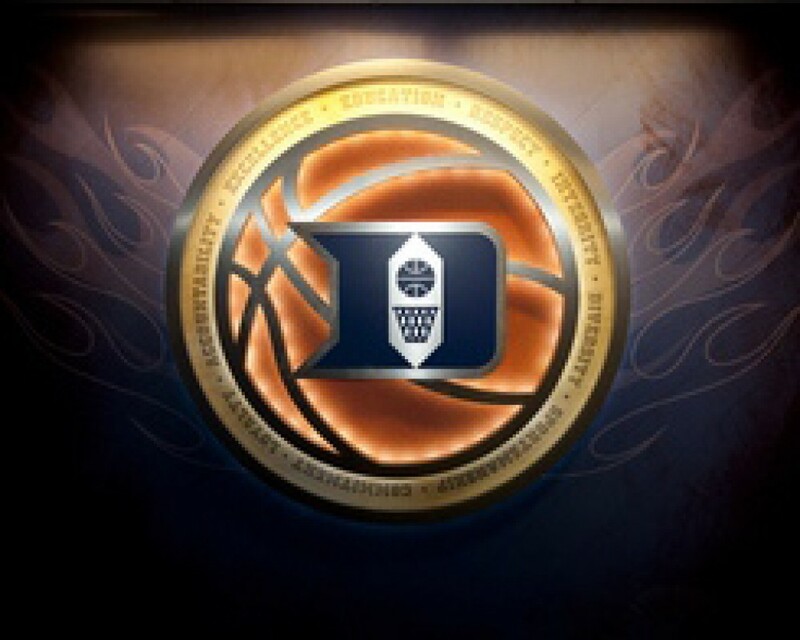 How much did this 5th Duke Championship mean to you ??? Did you celebrate then wake up the next day wondering if, or hoping, next season’s team can repeat this, essentially moving on immediately ??? So you may have followed Duke for years. You probably saw The Shot and Shane Battier’s Block but this 5th Championship probably doesn’t mean as much to you as it did to Quinn Cook. No player has suffered such heart breaking losses at Duke (other than Jeff Capel, but Coach K didn’t coach that team). He was injured so that doesn’t count) in Coach K’s time like Quinn Cook did. Cook has had a lot of love since the season wrapped up, but it isn’t enough. This is what sports is about … triumphing over adversity. He started his career at Duke as a bench warmer, and lead the Blue Devils to a Championship his Senior year. What is the single most solitary aspect of this team that you will always remember about this team ??? I believe that right from the start, this team always gave the impression that they genuinely liked each other, wanted to play together, and left their egos at the door. They seemed to double-down on this attitude after the dismissal of Rasheed, which led many to believe that he was more of a detrimental distraction more than was reported. This team will always be remembered as the first non-Kentucky “one-and-done” squad to win a Championship. This will be a shame because there is more to this team than that, however that’s how people will remember it. This team marked the first time Coach K won it all with a team dominated by “one-and-done” Freshman. Do you think of this as a pivotal impact point on the balance of Coach K’s career ??? I never thought I’d have to admit this, but yes it does. I am as happy as any other Duke fan that they won the National Championship, but it came at the cost of capitulation. I only hope that a “2-and-done” scheme may be adopted by the NCAA/NBA in the not too distant future. I’d even be happier if the MLB version were adopted. Nonetheless, my hat is off to Coach K for managing these youngsters, and to them for winning it all !!! I wish them the best in their individual futures. The man has won in 4 decades, under different rules, and different cultures. Surely that is more of a testament to his staying power and flexibility. 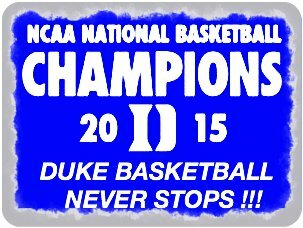 Thanks for sharing this retrospective of Duke’s return to glory !!! One of the most incredibly special honours any player can have is to have his (or her) jerseys retired by their schools. Recently three Duke standouts experienced this honour. Chris Collins’ #20 and Jon Scheyer’s #23 were retired by their High School, Glenbrook, North in Illinois. Interestingly enough, both have gone on to coaching positions with Duke, when their playing days were done. Chris has become the Head Coach at Northwestern, while Jon is in his second year as a Duke Assistant. If you take a moment to consider the odds of two youngsters playing for the same High School, then College, and then coaching at the same University, it boggles the mind. Makes you wonder what’s in the water there, eh ??? 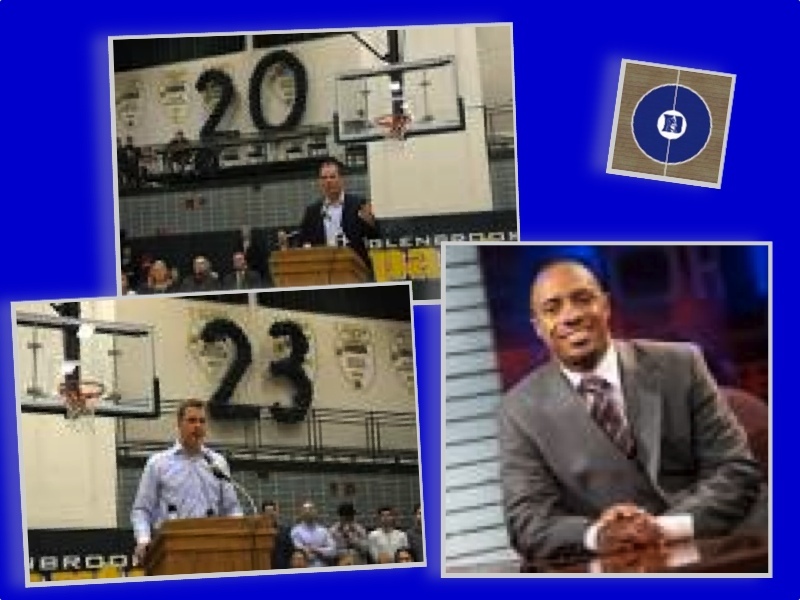 Jason “Jay” Williams has already enjoyed having his #32 jersey retired by St. Joseph’s High School in Metuchen, NJ. Recently Jay also had his old Grammar School retire his old #32 jersey. The former Sacred Heart School in South Plainfield, New Jersey extended that honour during a recent re-dedication of the school gymnasium. I have always had a special interest in Jay as I also attended Sacred Heart and then St, Joe’s some 26 years earlier. The gymnasium they re-dedicated was originally a church sanctuary built to be an essential part of the student’s daily lives, then for the congregation on Sunday and and other Holy Days. As a 6th grader, I was part of one the first squads to play on that “real” gymnasium floor, once the sanctuary had been re-located to a newly constructed church. A few years later, I would move on to St. Joe’s and have my basketball career stunted by a freak accident just as basketball season began. I put my hand thru a glass door on my way to Science Class in an annex. My hand, deeply cut, meant my playing days were essentially over. I’ve long enjoyed what might be the closest connection a fan can have to a player, and while St. Joe’s has seen other players continue their careers, none have done it the way Jay has. Many do not know that he excelled at other interests from the classroom to Chess. He is now an integral part of ESPN’s college basketball team. Having a Grammar School recognize his achievements is certainly a grand gesture, but one most certainly appropriate. I guess you could say that having your jersey retired in all three of your schools is the ultimate “Trifecta” !!! “Jon” to all of us, is a well known role player at Duke, having led the 2009-10 team to the last National Championship for the school. Very often called on to switch from his natural Shooting Guard position, he always did so with great aplomb. During his four (4) years at Duke, his pages and pages of accomplishments, are something I suggest you look up and marvel at when you have the time. He will always be remembered as a deft shooter from anywhere on the Court, especially from the Charity Stripe. His trademark passing and acrobatic penetrations to the basket made some equate him to “Pistol Pete” Maravich. He produced one of the best Assist-to-Turnover Ratios in the country his Senior year. After cutting down the Net in Indianapolis, Jon went undrafted but was signed to the Miami Heat’s 19 man Summer League roster for 2010. As expected, he excelled, but his success was short lived. In July, he was poked in the right eye. The injury tore his eyelid, detached and tore the Retina, and injured the Optic Nerve. The injury also caused him to suffer from incapacitating headaches. Essentially, with his eye fully healed, Jon got some time in with the Houston Rocket’s D-League squad, he averaged 13.1 Points, 4 Assists, & 4 Rebounds. Then he signed with Maccabi Tel Aviv of the European League and played a year there. He came back to the states, played sparingly in the 76’ers Summer League and for Spain’s Gran Canaria. As anyone who knows, Coach K keeps tract of his extended family. Understanding the potential Jon could bring to the sidelines, he appointed Jon as a Special Assistant, filling the spot left open when Chris Collins left for the Head Coaching job at Northwestern in 2013. The next year, Jon would be promoted to Assistant Coach when WoJo was named Head Coach at Marquette. Jon brings plenty to the Coaching Staff, but moreover, as a four (4) year graduate, he understands, along with Jeff Capel and Nate James what fully matriculated players mean to the Duke programme. I’m sure he will be at Duke for a long time, and I doubt if you could find anyone who doesn’t think that it’s a great idea !! !